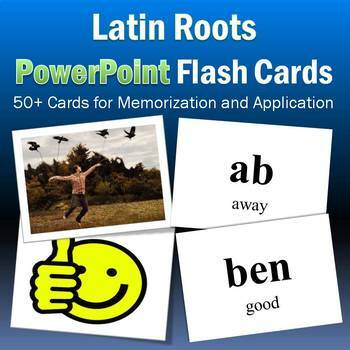 These flash cards work like traditional flash cards except instead of using plain ol' text, they use interesting, colorful, funny images and animations to teach your students the meaning of academic word roots. You show an image or animation to the class, and students mentally connect that image or animation to a Latin root. For example, you might show a slide with an image of water pouring from a faucet. Students look at the image and think, "Water, ...aqu!" They associate the water with the Latin root aqu. A meaningful and lasting mental connection is made. I've used this mnemonic tool many times with middle school English and Science classes. The students enjoy it and it works. Latin roots are word parts that have meaning. They are the building blocks of thousands of English words. Benevolent, malicious, amorous, aquifer, magnitude, migration — the list goes on an on — all of these words contain Latin roots. Knowledge of word roots and their meaning is important and useful for our students because it gives them the ability to decode the meaning of unfamiliar words in a variety of situations. Why use these flash cards? 1. Teach to multiple sensory modalities. These flash cards have a distinct advantage over traditional flash cards in that they are BIG. You can use them with the whole class at once. You can also set them up at a center or classroom computer and have students rotate through individually. This bundle covers the following Greek roots.